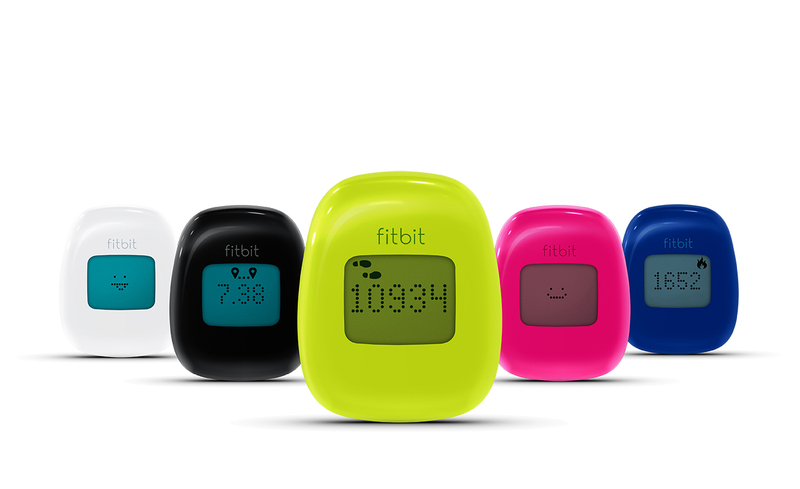 iPod nano and the New Nike+ Active – A Perfect Match? After the latest software update for the 6th generation of Apple’s iPod nano, the Nike+ features have now been extended to monitor the steps you take throughout your day. 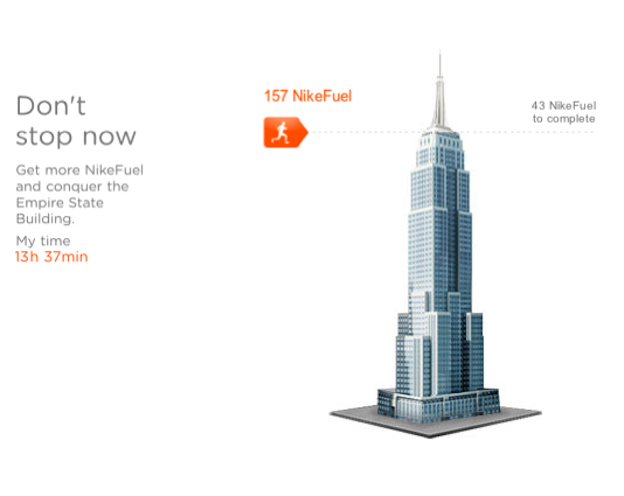 With the new Nike+ Active your step-count contributes to an engaging online game experience. How well does Team Apple/Nike work? I probably don’t need to talk too much about the iPod nano. Most of you already know it is a tiny portable music player that comes with fun add-ons such as different clocks and photo albums. 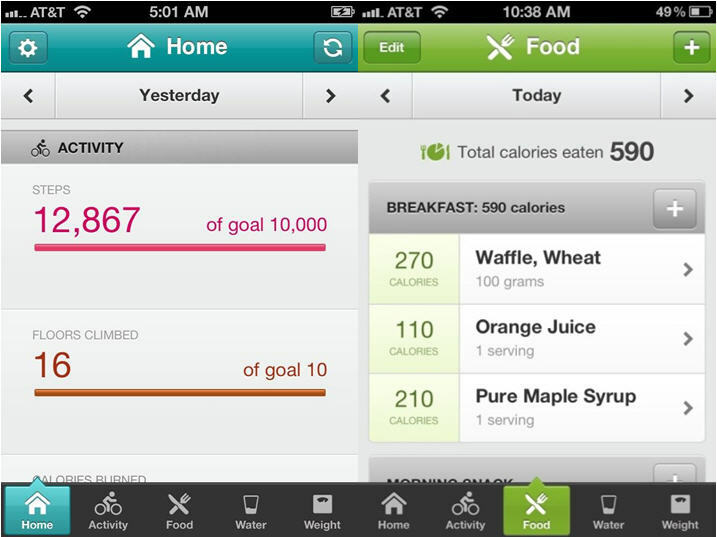 Thanks to the latest software update (Version 1.2) the Nano’s Nike+ feature now has a new function called “walk”. With it, you can easily count the number of steps you take throughout the day with the integrated accelerometer and sync your step-count with your Nike+ Active account. This still requires iTunes and a cable connection, but what you can do with your steps on the Nike+ Active website is worth the hustle. 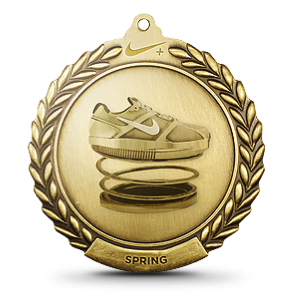 Once your data is uploaded to the Nike+ Active website, your steps are rewarded with a virtual currency called NikeFuel. For those who are into running or gym, these are additional ways to earn NikeFuel. With this currency, you can play an online game with the aim of conquering cities around the world and encountering renowned landmarks. There you are presented facts and photos of the sights on your route, making it all like a virtual trip around the world. Starting in New York, you move up over the Brooklyn Bridge, the Statue of Liberty and the Empire State Building. After having conquered one city, you can then move on to places like London, Paris or Tokyo. 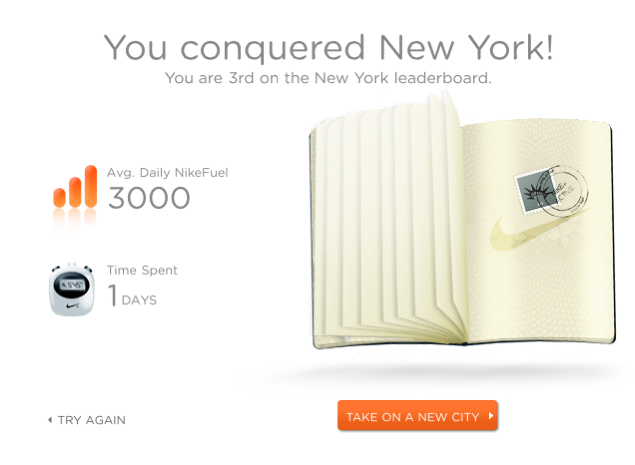 Several game mechanics such as rewards and leaderboards keep the users engaged in gaining more NikeFuel through their real world activities and make the users stay motivated to sync and play regularly. Additional fun features allow e.g. pasting your face onto the Statue of Liberty and posting the picture on Facebook. Already known for their mobile apps such as Nike BOOM or Nike Training Club, the company once more has shown that they really understand gamification. 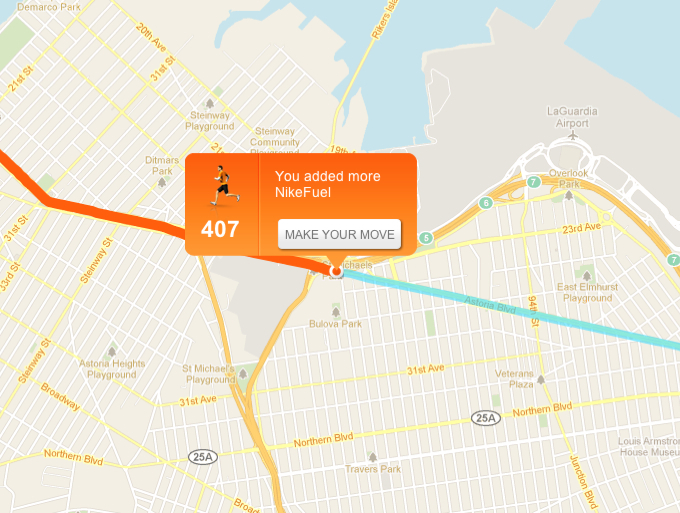 Although it is still in the beta phase, the new Nike+ Active is a promising approach to engaging users in personal fitness. Who is Nike+ Active for? 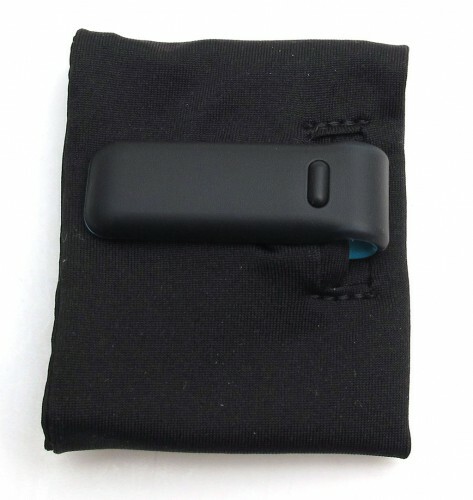 Unlike Runkeeper or Fitbit, the combination iPod nano/Nike+ is not so much intended for seriously tracking and aggregating general health information. Instead, it puts its focus on having fun, which works great to form a positive feedback loop for your daily walking habits. This makes the Nike+ Active perfect for anybody looking for some motivation and fun on the go. 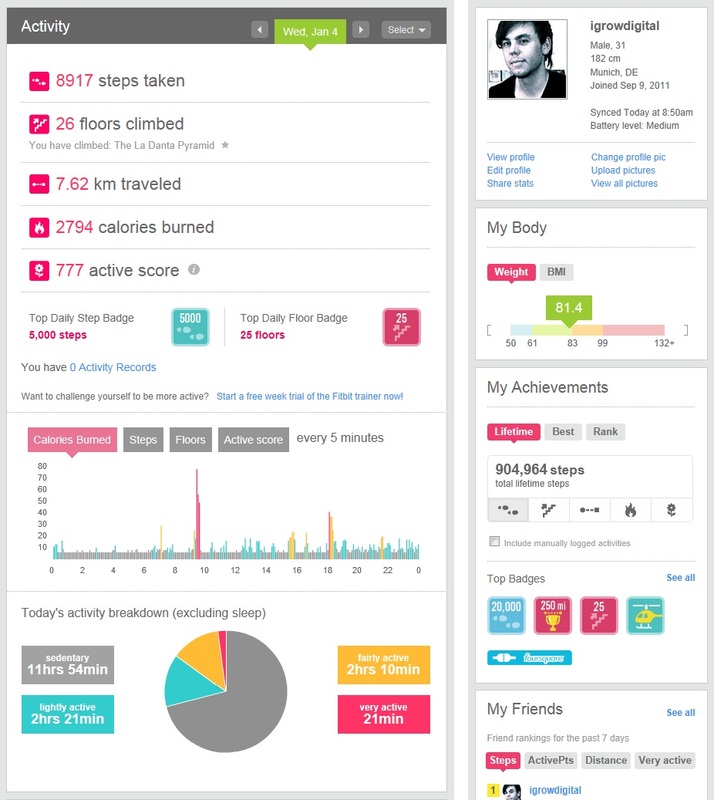 Since Nike+ doesn’t share user data with third party services, its value for Quantified Self purposes is limited. I hope Nike+ will change their strategy and contribute their fitness data to a richer set of personal health information in future services. If you’re intersted in first getting to know Nike+ Active you might want to try the Nike+ app for 1.99$ on your smartphone, which is synced with Nike+ Active as well. 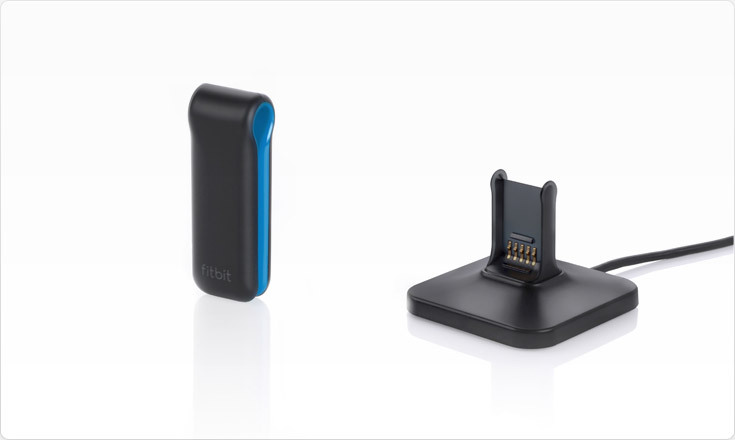 However, using it 24/7 will quickly drain your mobile’s battery and won’t deliver appropriate results without an accurate GPS signal, for example when you’re indoors. 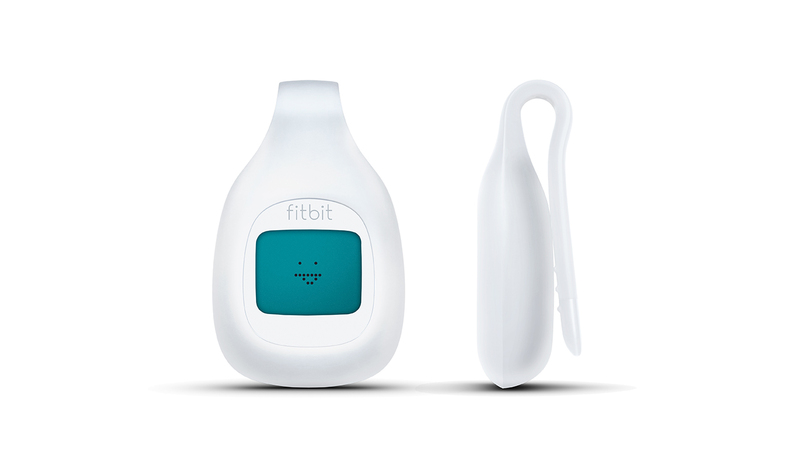 I’ve been using Fitbit for quite some time now and find an independent and wearable pedometer, which doesn’t interfere with my smartphone works much better for the time being. By really counting every step you take, you can get a holistic overview of your over-all fitness efforts instead of narrowing your view on just your weekly workouts. Once you’ve decided to become part of the Nike+ Active game, I would definetely recommend buying the nano. More than a pedometer, you will get a slim and lightweight music player that allows doing your workouts without carrying the bulky smartphone around. I am sure the visionary Steve Jobs put several more grand strategic decisions towards a healthier lifestyle into place before leaving us. For this, and for so much more, my deepest appreciation goes out to His Steveness.